It's hard to believe that Fashion Week is less than a month away and Fall is right around the corner - especially considering I just spent the weekend at the beach soaking in the sun. Summer has flown by and I'm not quite ready to say goodbye yet. However, I am ready to take out my Fall staples from the dust bags under the bed and say hello again to my favorite leather jacket (a great option that won't break the bank here) and striped long sleeved tees (my current favorite). I'm also looking forward to investing in a few, new Fall staples - i.e. a leather skirt, a new pair of booties (love Freda Salvador's options), and a classic tweed blazer (IRO makes the best ones). My first purchase may have to be this skirt from Banana Republic because the quality of the leather is so soft and luxe. I also may need to pull the trigger on these booties because after seeing them in person at the showroom, I can't get them out of my mind. All this before September 5th rolls around and the frenzy of NYFW begins. Black and navy is definitely a favorite color combo, it is quintessentially fall! I started loving this color combo last fall/winter. I can't wait to put them together again. As much as I love summer, I am ready for fall weather. A leather skirt and a leather jacket are both on my fall wishlist. I love love that first look. So excited for the new fall fashions! Cant believe it's almost here! I always have loved pairing navy and black together. I don't think it's a no-no at all! 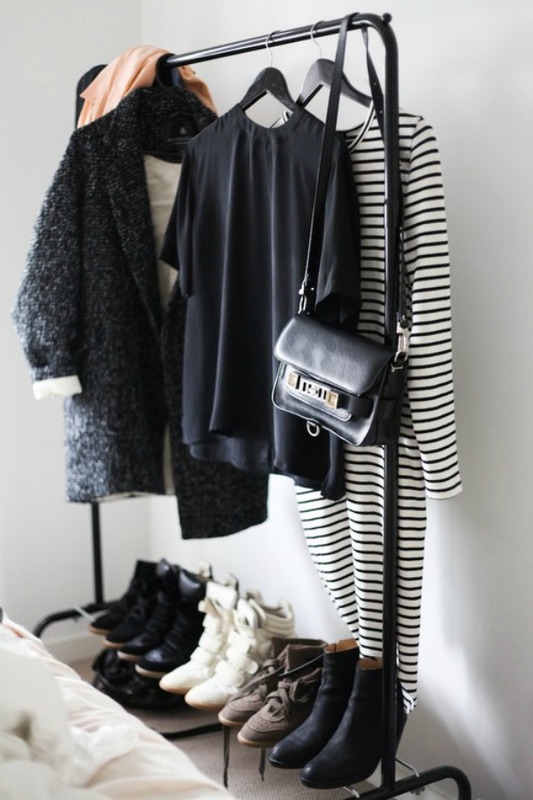 Loving all this black and white inspiration! Classic color combination! It's hard to believe that fall is literally just around the corner. I love this color combo...I am dying for an Iro blazer!